The 3rd-generation Nest Learning Thermostat is by far the best smart thermostat you can buy. And now, the best smart thermostat you can buy is back on sale at its lowest price of the year. 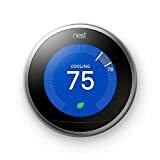 Amazon has the Nest Learning Thermostat back in stock at just $199.99, and that price is good for all three of the unit’s most popular color options, including stainless steel, white, and the very unique copper color that people love. There’s no telling how long Amazon will be able to keep Nests in stock though, so grab one while you can.